Oh, this is just an amazing FairyBag. 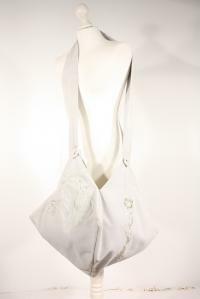 Made from an off-white suede, decorated with art-deco-style embroideries on all foursides and fabriclined. it has no inner pockets. Cause of the typical FairyBag shape (i just learned that it is called a "Rhomboeder" ;-)) it has so much space inside, you can fit in a small weekend-shopping if need be! The hight is approximatly 40cm.